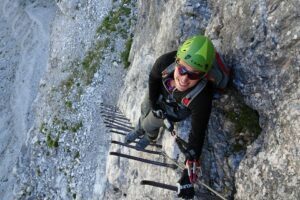 Tofana di Rozes circuit and the historical ferrata Minighel ladder! HomeHikes and Trekking The walk around Tofana di Rozes and the ferrata Scala del Minighel. 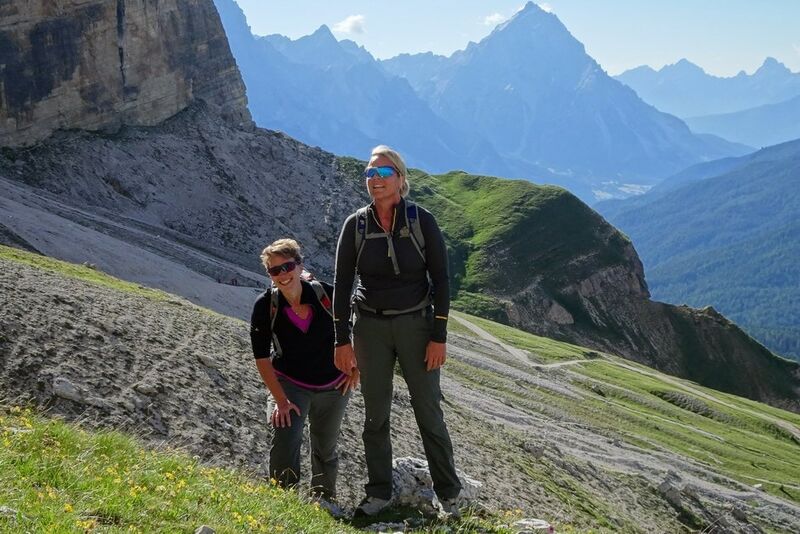 The walk around Tofana di Rozes and the ferrata Scala del Minighel. The Tofana di Rozes circuit is definitely one of my favourite outings because of its wonderful natural environment, interesting history in both war and peace and for the legendary Minighèl ladder and Tofana di Rozes itself which, for me, is the most beautiful mountain in the Dolomites. It is a beautiful outing, I believe, not too long but requiring a good level of fitness all the same. It is a circuit route which starts from Rifugio Dibona which you can get to by car. The starting point for the Tofana di Rozes circuit is Rifugio Dibona (2083 m.). From Cortina d’Ampezzo take S.S. 48 delle Dolomiti in the direction of Passo Falzarego. A few hundred metres after Locanda del Cantoniere and then the little church of Vervei, turn right at the junction following signs to Rifugio Dibona and Rifugio Duca d’Aosta. 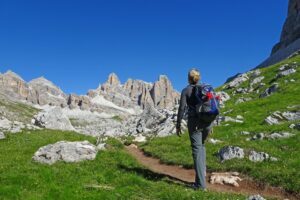 From the car park walk follow the clear gravel road in the direction of the majestic Tofana di Rozes to the teleferic used by Rifugio Giussani to supply the refuge, which you reach in 10 minutes. I have happy memories of days when, after long climbs and equally long partying at Rifugio Giussani, “Tòio” (Vittorio Dapoz, the manager of the refuge for 38 long years, until 2011) ‘loaded’ us onto the wobbly teleferic basket which took us down to the valley again over a few hundred metres of dizzying and unforgettable gradient change. Just before the teleferic, which you pass on your right, turn off the road onto footpath 442 following signs for Grotta di Tofana and Via ferrata Lipella. After a short level section, the footpath starts zigzagging up towards the imposing south face of Mt. Rozes. Continue on straightforward footpath 404. N.B. After a short descent this takes you to Forcella Col dei Bos (2331 m.) where the ruins of military artefacts and trenches, traces of World War One, are visible in the midst of boulders left there by landslides and rock falls. An interesting botanical fact: in this area you’ll see monk’s hood (aconitum napellus) a poisonous plant which can grow to heights of almost a metre and produces a great many bright to navy blue flowers in a single straight stem. It was known to the ancient Greeks and is one of the most poisonous plants in Italy to be found in the Alps. Forcella Col dei Bos offers splendid views of Cime di Fanis and Torre Travananzes, at the foot of which you can clearly see the colours of the geological formation called the Raibl layer. Monte Cavallo is also visible and below you is the long and deep Travenanzes valley. To the right of Val Travenanzes are Mts. Tofana di Dentro, Tofana di Mezzo and Tofana di Rozes. At the col, the meeting place of many footpaths, we descend gently on footpath 404 into Val Travenanzes. If you are happy to wander a little around the boulders surrounding you, you will see that some of them have been expertly excavated and transformed into formidable Austro-Hungarian fortifications. These boulders offered impregnable positions such as Sasso Misterioso which you can see if you look up towards Castelletto. It owes its name to the fact that sentries sent out on night-time patrol in the area mysteriously disappeared and never returned. A great many battles took place around this boulder, especially at night. This was once site of Viktor Wolf Von Glanvell Hütte, built in 1906-07 by Luigi Gillarduzzi Minighel for the Sektion Dresden of the Deutscher und Österreicher Touristenklub. Now all that has remained of the old refuge is just a few ruins, just a little to the south of modern day Cason de Travenanzes. But our route does not take us to this plain. Before the path reaches it we turn right following the signs for Ra Šàra del Minighèl (the Minighel ladder). In just a few minutes we get to the ultra-steep Minighel ladder, alongside a crystal clear waterfall, Pišandro del Majarié. The Minighel ladder, Ra Šàra del Minighèl in Ladin, is a truly curious ferrata both for its history and the way it is made which is different from the all the other ferratas which I have done in many years of mountain walking and climbing. We now need to put on our harnesses and the other equipment we need to do the Souto del Majarié, the vertical rock face above us, in total safety. The ferrata is a short one but whilst it is not technically difficult it is extremely exposed and can be a considerable challenge to the courage of anyone not used to this type of climb. At the end of the ferrata we must now ascend the Majariè glacial cirque (masariè means large boulders) on footpath 403 which takes us to the end of our climb and Rifugio Giussani. This refuge is a must. Situated at Forcella Fontananegra, in the heart of the Tofana massif, the refuge has a bar and an excellent refuge where you can try out the area’s delicious specialities. The Dapoz family, which has been managing the refuge for two generations, will give you an authentic welcome. After a much deserved break continue in the direction of Rifugio Dibona, the circuit’s finishing point and just 45 minutes’ walk. 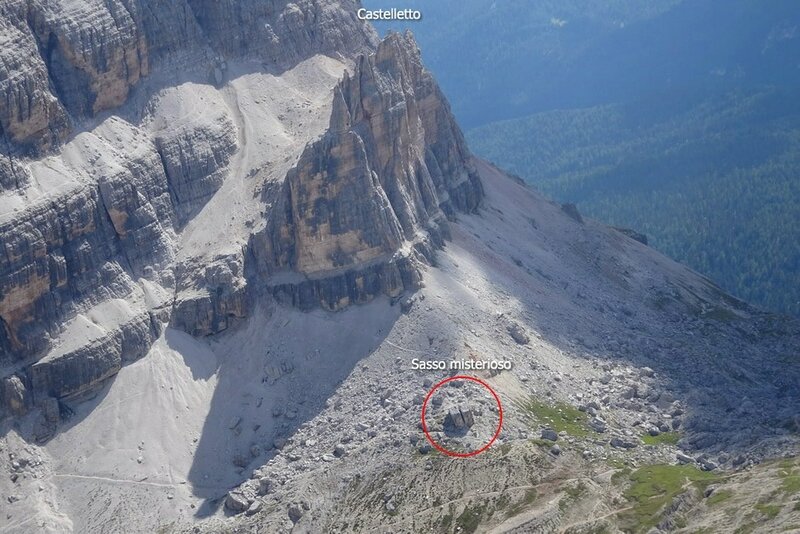 Not far away from Rifugio Giussani, on the left-hand side, you’ll see the ruins of the old refuge. 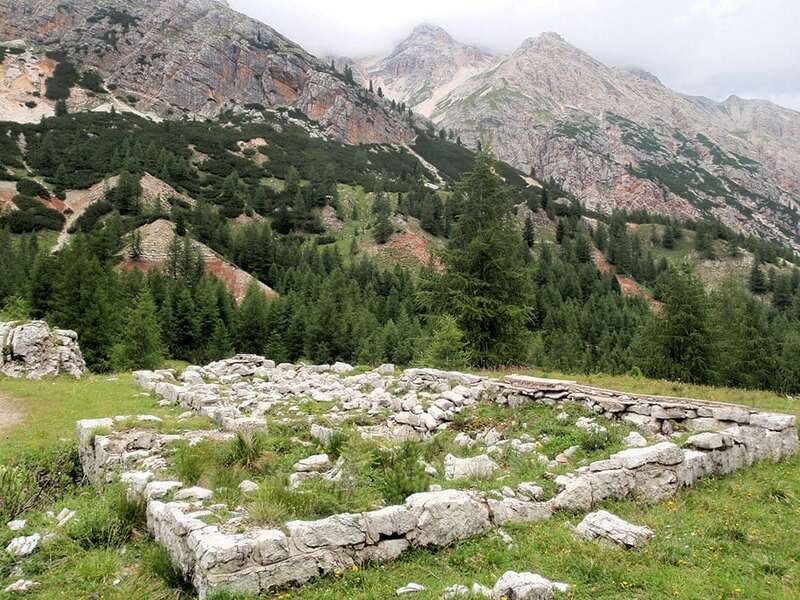 It was opened on 16th August and called Rifugio Tofana and destroyed in World War One. On 5th September 1921, after renovating a large Alpini barracks, the Cortina section of the CAI opened the refuge dedicated to General Antonio Cantore (who fell at Forcella Fontananegra on 20th July 1915). On 17th September 1972 the third refuge was opened and dedicated to mountaineer and lawyer Camillo Giussani. The Cantore Refuge is now abandoned while Tofana was renovated in 1994 and is now used as a winter shelter. A straightforward walk along this mule track takes you back to your car completing a circuit which has taken you all the way around the magnificent Tofana di Rozes. 830 metres approx. with the Minighel ladder. 960 metres approx. 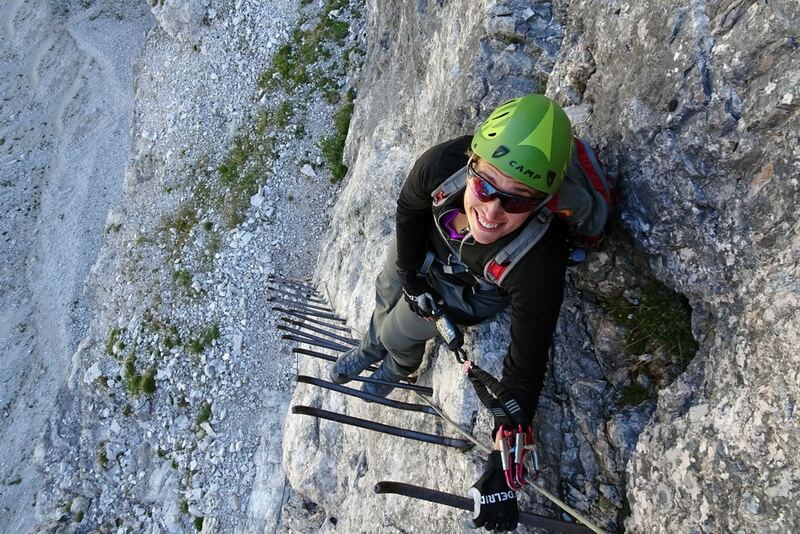 if you climb up near Malga Travenanzes on footpath 403 instead of doing the ferrata. 4 hours 30 min. ca.